Brisbane’s Story Bridge from Captain Burke Park. A freewheeling weekend in the Queensland capital where the sky was ridiculously blue and the river set the pace. Having never been, I always thought Brisbane was ‘beachy’ and I don’t do ‘beachy’ – even before the wheelchair. But over a few days I found it’s not about beaches (there’s one & it’s artificial) it’s about the river and lifestyle surrounding it. At breakfast I asked David, who lives in Brisbane, his favourite thing about the city. ‘Rolling along the Riverwalk’ he answered. He occasionally gets a work out by rolling his wheelchair the 2km stretch that snakes along the river from Tenerife to the Powerhouse. People seem to be drawn to the river here. Brisbane isn’t entirely wheelchair friendly – parts of the city are hilly & Paddington is out of the question without a car – but you can see the best bits without too much trouble. Here’s a few places we’d recommend. If the river through Brisbane looks like a hand-painted capital ‘W’, which it does, then Fortitude Valley is in the centre-top. James Street is in ‘the valley’ & it’s an upmarket area that’s expanding for the locals and happily growing for visitors. Around here you’ll find small fashion houses and familiar names sitting alongside homewares and jewellery. At 8am the market had already stretched to life and the cafés were busy. There are all walks of life; tradies are waiting for egg and bacon rolls, new mums are cooing their infants and the suits are sorting schedules over strong lattes. There’s a wide range of food here - the standard fruit and veg, cakes and conserves, sushi and sourdough. It’s a concrete paradise too with ramps and access to everything. We headed to Wandoo Street next to the market for our morning caffeine fix. Alongside the roasting warehouse runs a laneway dotted with outdoor tables opening up to a little green café space. There’s an industrial feel with plywood shelving and a corrugated iron wall. Specialty roasts are the way they do things here and the listed on the wall daily – the staff are happy to help. They helped too with suggestions on where to visit when they found out we weren’t locals. Simple breakfast menu is on offer with all the favourites listed. Apparently, they do amazing duck pancakes too. 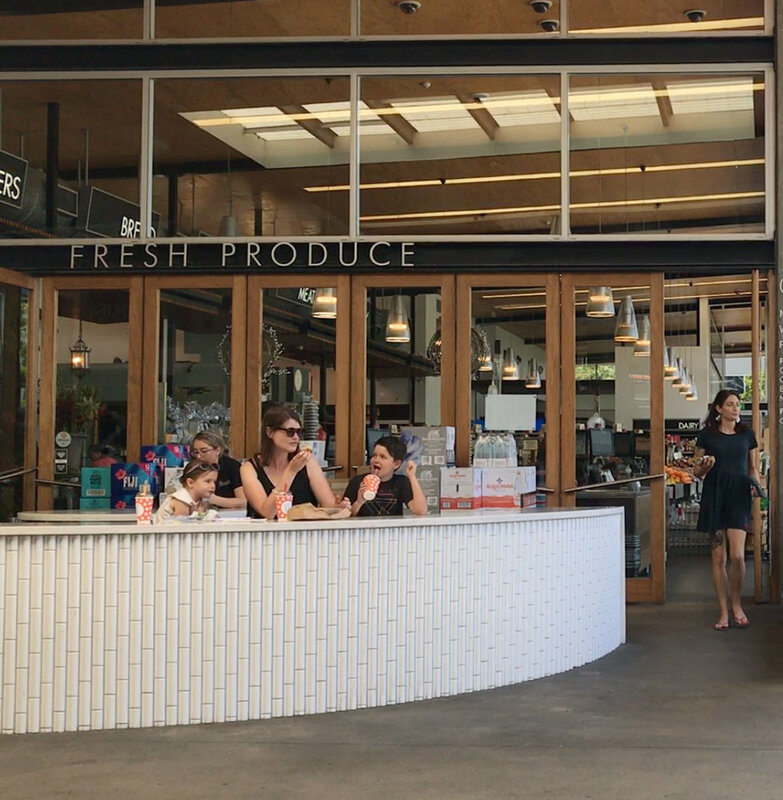 James Street Market has groceries, cafes & delis & cooking classes. The Gallery of Modern Art, Brisbane’s GOMA, sits by Kurilpa Point Park. Not surprisingly, like most Australian art museums, it is completely wheelchair accessible. What is surprising though is the scale of this gallery. It’s formidable - the largest gallery of modern & contemporary art in Australia. Back when it opened, a little over 10 years ago, it must have been a cultural coup for the city. It’s been home to heavyweight exhibitions over the years; Picasso, Warhol, Matisse and more recently Gerhard Richter and Yayoi Kusama. We recommend buying a ticket to the current exhibition, whatever it might be. You won’t be disappointed. We wandered through the big striking spaces and enjoyed the gallery almost as much as the artworks. Even if you’re not into art it’s a calming & serene place for a roll. If you still need to exercise your eyes, take a lift to the upper floors where there are worthwhile views and photo ops. GOMA’s café bistro on the riverside has table service and a seasonal menu with share plates, burgers and drinks. We stopped here considering French fries and French champagne, settling on the Greek salad and Australian sunshine. ‘West-side is the best side’ or so the saying goes – head to Brisbane’s West End and decide for yourself. Boundary Street Food Market, officially located on Russel Street, is tough to beat for casual international eats. We counted 8 different nations at the food stands; all with well priced plates & plenty of vegan and gluten-free options. The food market shares space with ‘Rumpus Room’ so it’s a licensed, open-air affair. The area is flat and we found it to be just the right kind of busy. We arrived around 9:30pm and after a few minutes deciding, we opted for the Turkish platter. It was crisp and fresh with olives, falafel and salad. You get the sense this is where the local 20 and 30-somethings sit, chat, eat and drink – away from the river and the tourists. At ten-thirty Saturday night the atmosphere was fun and lively but contained. Bigger cities would be getting loud and loose by now. Are they somehow more sensible and subdued here in the north? Talking to a stall-holder apparently, we’d arrived on a quieter night, stay a bit longer and things would dial up he predicted. He smiled, packed up and before leaving handed us each a vegan doughnut – which was sublime, sugary goodness. There are no doubt some cool bars in the West End – BOSC (The Bar of Social Conscience) looked green and lush, The Bearded Lady was belting out live music and the Catchment Brew Co was looking lively - sadly they weren’t roll in accessible. Not disappointed and ever curious, especially of laneway bars, we discovered The Brisbane Brewing Co - a bar slash microbrewery. We entered past Brisbane’s politest bouncer to find dim lighting and a cool crowd. The range of beers, as you might guess, is impressive with tap beers brewed on-site. The brewing principle here is strict – just barley, yeast water & hops. We recommend taking a seat next to the vats and sharing a plate. There’s a gentle ramp up to the bar and restrooms next to the restaurant. Brisbane Brewing Co is accessible close to the Boundary Street Market. A good spot for a microbrew & share plate. 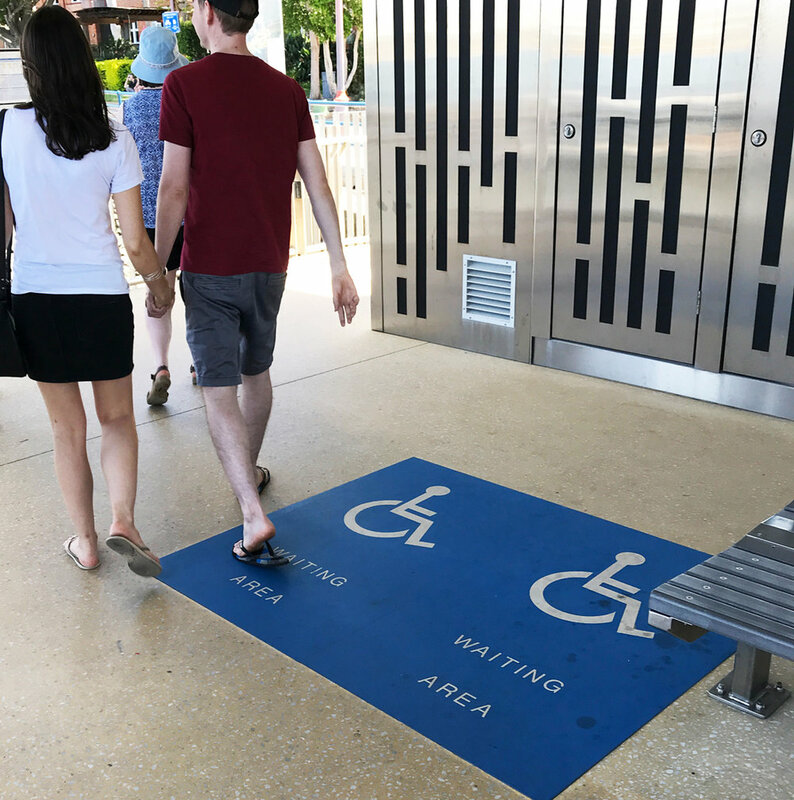 Newer CityCat Terminals have wheelchair waiting areas. The only beach in Brisbane - inland & artificial there are beach wheelchairs available. Watt Bar is part of the Powerhouse offering & perfect for pre-show drinks. It’s close to Teneriffe ferry Terminal or there are ‘blue badge’ carparks right out the front. It would be remiss not to mention the CityCat. The ferry network sails the Brisbane River servicing 25 terminals between the University of Queensland in the west and Northshore Hamilton in the east. It must be the most scenic public transport in the country. For passengers, it’s practical - we were shuttled around from Powerhouse to Southbank in no time while breathing in the beautiful river views. They’re completely wheelchair accessible with marked areas on-board and we saw no special treatment – we boarded like everyone else. On one trip the PA system politely requested anyone who could break a fifty-dollar note would be appreciated at the ticketing area. A reminder how laid back the culture is (and to have change or a go-card handy when boarding). Theatre, Comedy, Music, Circus – anything of the performance variety usually finds a home here. When we visited comedian Arj Barker was in one space and the stage show of a Bafta winning production was in another. It’s diverse in its offering and there’s always something on. It’s a gigantic building and the industrial conversion is worth a look even if you’re not checking out a show. The entire space is wheelchair accessible with lifts, ramps and automatic doors. The bar, Watt, has a good outside space with mixed seating and plenty of room. Ticket or no ticket Powerhouse is worth a visit for a drink or a meal at Bar Alto. The views and ambience make for an easy-going warm afternoon. If there’s one area where almost all common holiday needs are covered it’s South Bank. It’s kid-, wallet- and wheelchair-friendly. It spans the shoreline from GOMA to the Maritime Museum and it feels like an entertainment precinct. This area is home to an artificial beach and lagoon, a ‘Rainforest Walk’, the Wheel of Brisbane and on Grey Street, more eateries and bars than we could count. Swimming-wise the clean and safe (chlorinated) inland water spots are hugely popular day and night and there’s free access to a beach wheelchair should you fancy a dip. There is development under Story Bridge, retail is evolving in James Street and apartment blocks are going up throughout Teneriffe & New Farm. Maybe it’s normal growth or maybe the word is out & Brisbane is having a moment. Either way, there’s a definite Brisbane buzz. 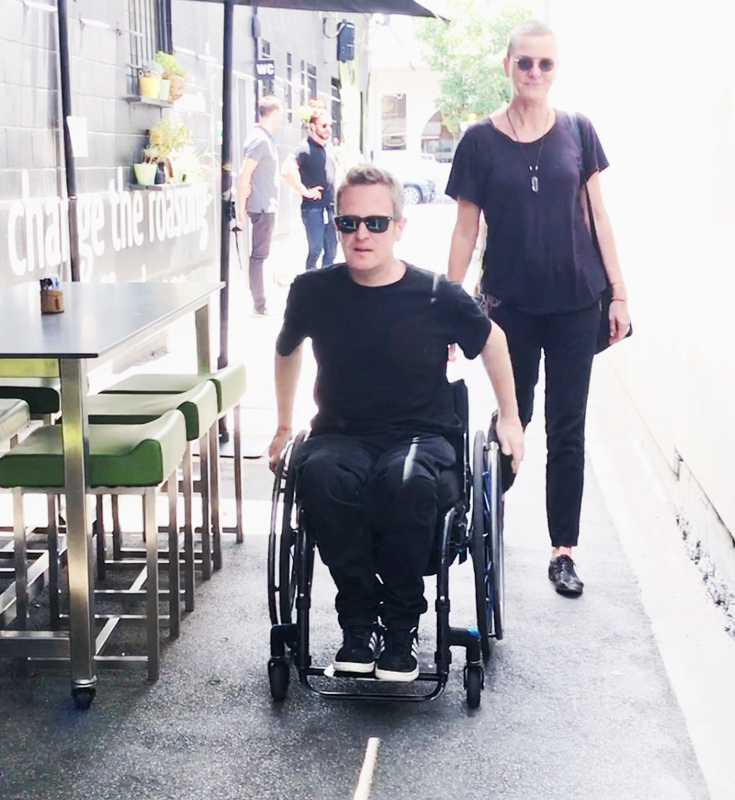 As far as wheelchair accessibility goes, Brisbane is better than Sydney but not as good as Melbourne. Its spaces are generally flat and if someone can help you they will – gladly. The Queensland capital has a lot to be grateful for – the water, the sun and a growing pride in identity. Ryan paid his own way in Brisbane & would happily do it again.